The home’s old spiral staircase, which split the plan in half and obstructed water views, was torn out and replaced with a new stair that starts on the right and winds its way up to the second-floor catwalk and third-floor bedroom and study. (Photos: Peter Murdock). 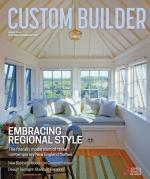 Imagination plays a big part in designing custom homes. Even though clients usually have a smaller budget for a vacation home, they want to make it distinctive. The homes depicted here make a statement, with dramatic features that the client, architect, and builder worked closely together to achieve. Judy Garland once spent part of a summer at this 1965 A-frame on Fire Island, N.Y. But as the decades passed, the beach rental began to show its age, with dark, unusable spaces and a 6-foot spiral staircase that split the home and blocked views of the Great South Bay. A couple who had been vacationing in Fire Island for 10 years recognized the potential of the old A-frame and purchased it with a complete renovation in mind. New York City-based Bromley Caldari Architects broke through the envelope of the building to weave the sculptural staircase through the airy, three-story structure. Builder Walter Boss replaced several old layers of roofing with insulated panels and a folded-seam metal roof. Large bay windows capture views to the east and west, while skylights keep the house warm in winter and cool in summer (Photos: Peter Murdock). “Since it’s now illegal to build a three-story home in that community, the clients were happy about that, but they wanted a real staircase,” says architect Scott Bromley. The clients willingly sacrificed two of the original four bedrooms to achieve that goal. With the lot coverage at its limit, Bromley Caldari took advantage of a local regulation that permits bay windows to protrude 2 feet beyond the existing envelope. The new serpentine, split staircase curves up and out from the first floor on the far right to a catwalk across the second floor, then curves back up and around to the third floor. Two large bay windows are staggered at different elevations on each side of the house. “Weaving across from one side to the other as you work your way up the three floors, you see views of the bay that are framed at each elevation,” Bromley says. The home has 1,763 square feet of interior living space. On the main level, a double-height living and dining room stretches the length of the window-clad north façade. The open kitchen and utilities run along the south side. On the second floor, the master suite has full-height sliding glass doors that capture the view. When guests are present and privacy is required, the doors fog up at the flick of a switch. An amazing feat of engineering, design, and construction, the 76-foot-long skylight that runs along the roof ridge extends past the edge of the roof for dramatic effect. On the third floor is a secondary bedroom and a den that acts as a third bedroom when needed. 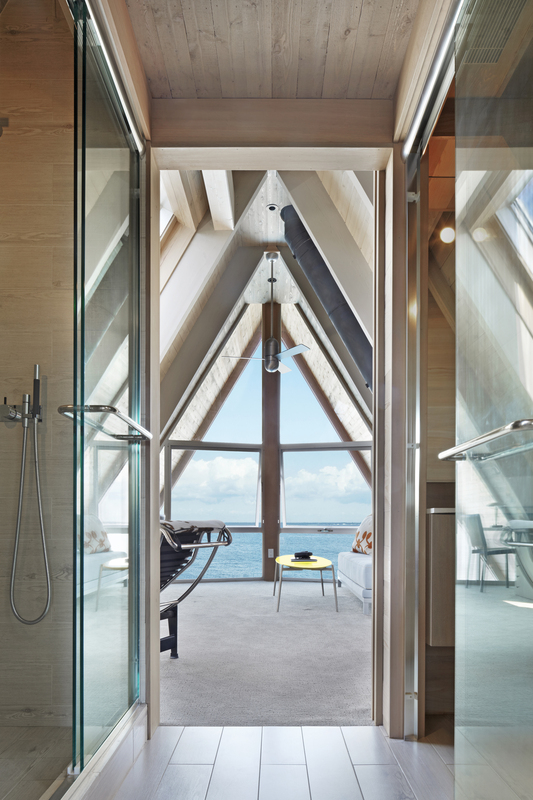 The two rooms are connected by a walkthrough bathroom with a glass shower enclosure on one side and a glass-enclosed powder room on the other. For privacy, there are pocket doors at each end. “In an A-frame, there’s a lot of interesting storage you can do because the roof is also the wall,” Bromley notes. At the bottom junction of the floor and wall, he designed built-in drawers, bureaus, and cabinetry, and concealed air-conditioning ducts. Boss rebuilt the foundation with new pilings and stripped off four layers of asphalt roof shingles. He then applied a double layer of 3-inch insulated roof panels, topped by a folded-seam metal roof. As a builder/remodeler on Fire Island for 40 years, Boss knows how to overcome obstacles in a creative way. Because it’s prohibited to drive trucks on the boardwalks, “We put a 1,500-pound machine on dollies that we made ourselves with pneumatic tires, and that’s how we got the equipment to the site,” he says. Boss negotiated with the zoning inspector to install hurricane-resistant, asymmetrically placed skylights that warm the house in winter and cool it in summer. Instead of making the staircase out of tubular framing, the stringers were laser-cut out of solid steel and welded to the rest of the stair parts. High-efficiency glazing was a must, especially in the skylights. 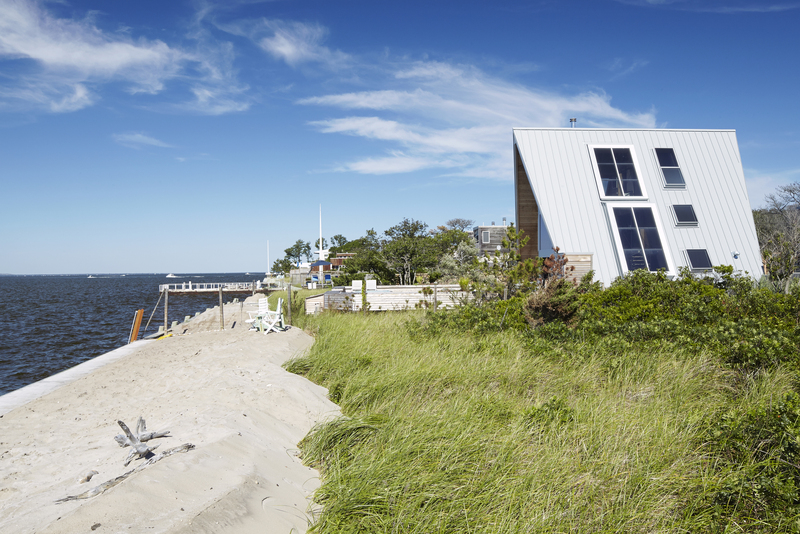 “We put in as much glass as possible because the front of the house faces north and didn’t have a lot of solar gain,” Bromley says, adding that the sloped roof is more efficient than a flat one in the island’s temperate climate. 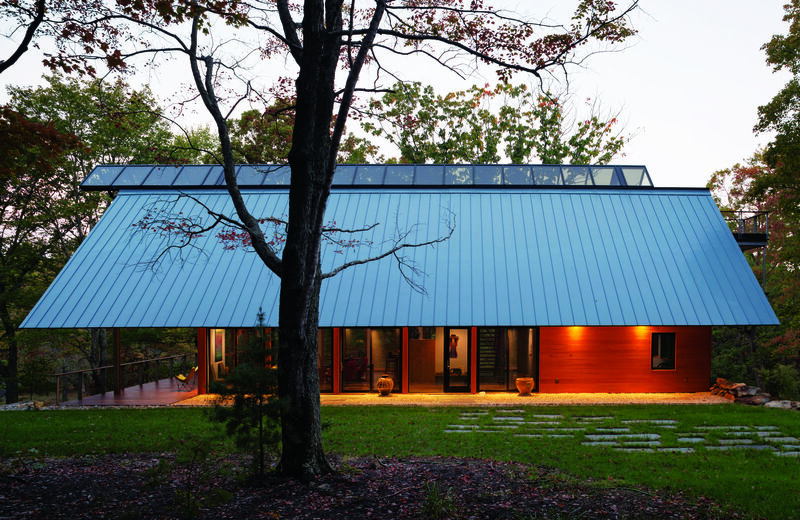 The home features a large metal roof with ample overhangs to protect homeowners from the glaring sun and pouring rain. It’s topped by the impressive skylight (Photos: Richard Leo Johnson). allow them to host trekking events and gatherings with friends and family. Originally, the home was to be a simple, rustic shelter of less than 1,500 square feet. Then the clients decided to add bedrooms for their two grown daughters and a large workshop for the husband, who is an inventor. 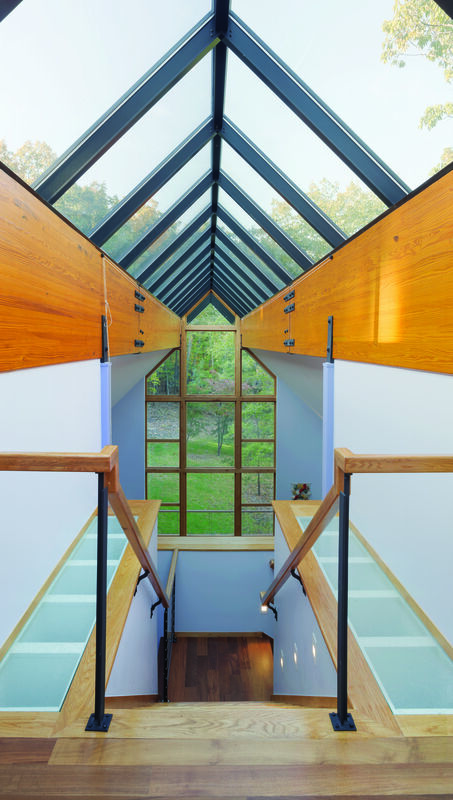 A 76-foot-long skylight forms the ridge of the steeply pitched roof. Harmon describes it as two folded hands that shelter the family below and give them a view of the sky and stars at night. The couple doesn’t cook very often, so they didn’t want a gourmet kitchen. As a result, the space is relatively small for a 3,300-square-foot home. But they did request a dog run and special sleeping quarters for their terriers, Kiwi and Luna. Therefore, in this home the open kitchen and living room take up approximately half of the main floor, and a guest suite occupies the balance of the space. The master suite is on the second floor, with a loft study that opens to the space below. The basement contains the workshop, the mechanical room, a powder room, and a multi-use space. The mountain location presented quite a few challenges for Greensboro, N.C., builder Bill Szostak, whose crew labored through the winter to construct a road leading to the property. “It had to be a very good road, since we were bringing in so much heavy equipment,” Szostak says, estimating that $80,000 worth of stone was delivered by truck. The builder was amazed by how much engineering and architectural thought went into the house prior to his involvement. “It’s basically a steel superstructure wrapped in wood to make it look like a log cabin, except that there are massive, 100-foot beams balancing the loads that are cantilevered over the walls,” he says. The home is a far cry from a rustic cabin, with its computerized sound and lighting system and a TV that pops up out of a slab in the basement. Onyx used to trim the master shower is lit by LEDs from behind and underneath. The onyx was padded out about 1½ inches to create shadow lines. Between the geothermal system and a huge solar photovoltaic array located in a field away from the house, the clients now have a very self-sufficient second home, and one that doesn’t require a lot of upkeep. Rain, snow, and leaves slide down the steep roof into a bed of river rock, then into a drain. Eight-foot roof overhangs protect the walls and finishes and create pleasant areas to sit outside, regardless of the weather. The wood siding and ipe decks weather naturally. “It was time-consuming, but it ended up being a beautiful job,” Szostak says. 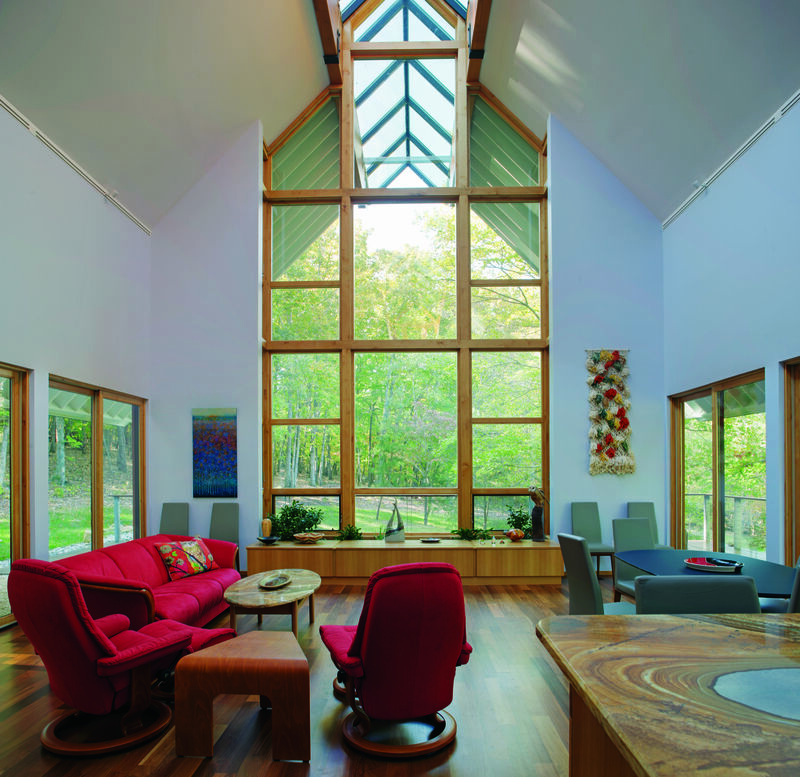 The majority of the first floor was allocated to the living and dining room — a dramatic, two-story space enhanced by large windows that surround the home and offer views of the forest. At the southwest end, the roof extends 20 feet past the outer wall. The bedroom porch and lookout perch cantilever 16 feet to the northeast. Szostak’s carpenters had to cut a T-beam into each of the ceiling beams to support the cantilevered sections, and “do a lot of specialty welding and bolting to put it all together,” the builder says. The key detail, Harmon adds, is that skylight with its atrium effect. While it added considerable expense to the project, “it brings light into the house that is just wonderful,” he says. Comments on: "Vacation Homes: Second to None"